When I read there were plans for a big screen outing for Paddington Bear I was worried. I grew up watching the BBC’s version of Paddington and I took the little bear to my heart. What if the modern-day CGI version ruined Michael Bond’s creation? I needn’t have worried. 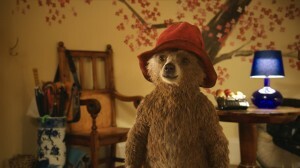 The 21st century version of Paddington is a joy to behold. Director Paul King and producer David Heyman (of Harry Potter fame) have brought the fun and spirit of both the books and the TV series to their film. What’s It About? The story begins in Darkest Peru where Paddington’s Aunt Lucy and Uncle Pastuzo are discovered by ‘the explorer’. From him they develop a love of the English language (spoken perfectly properly), London and (of course) Marmalade. Cut to 40 years later and Lucy and Pastuzo have adopted their orphaned nephew. Theirs is an idyllic life of marmalade making and dreaming of a trip to London. 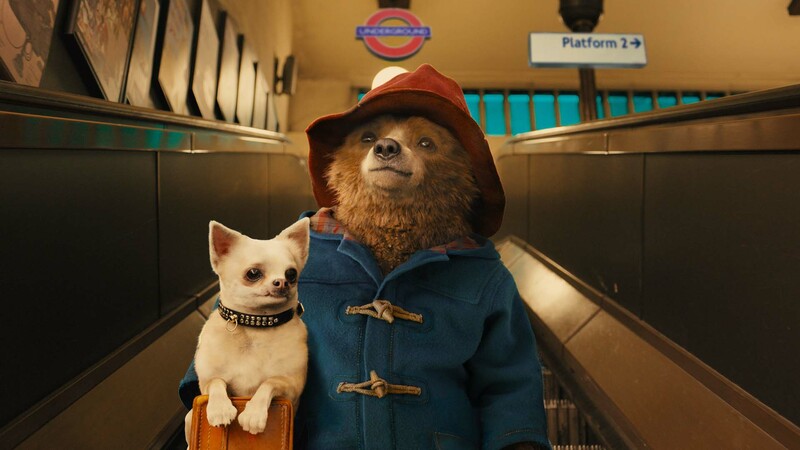 But when disaster strikes, Lucy decides to move into a home for retired bears and Paddington stows away on a ship to London because, as Aunt Lucy tells him, Londoners “will not have forgotten how to treat a stranger”. Paddington’s ship finally docks in London (the passage of time is illustrated by how many jars of marmalade he’s eaten) and through a series of events the young bear finds himself at Paddington station where he hopes to make friends and find a new home. Of course this is London and Londoners don’t talk to anyone, except for Mrs Brown who takes pity on Paddington (watch out for the lovely Lost And Found moment) much to the annoyance of her risk assessor husband and daughter Judy, who finds everything so embarrassing. After supplying her new friend with a name, Mrs Brown offers him a bed for the night and Paddington hopes he’s found his new home. But that may not be the case after he manages to destroy the family’s bathroom almost immediately. After Paddington tells the Browns the story of ‘the explorer’, Mrs Brown sets out to help the young bear to track him down and maybe find his new home. The plot also involves Natural History taxidermist Millicent – Nicole Kidman at her wicked best – who has her own reasons for getting to know Paddington. Verdict: The film features a great cast with Hugh Bonneville the human stand out as Mr Brown. I also loved Peter Capaldi’s turn as the Brown’s neighbour Mr Curry who develops something of a crush on Millicent. In fact, one of my few criticisms is that I would have liked to have seen him a bit more! Julie Walters as the Browns’ housekeeper Mrs Bird gets one big scene and there are also cameos from the likes of Matt Lucas, Matt King (Peep Show’s Super Hans) and Jim Broadbent as the kindly Mr Gruber who tells Paddington “a home is more than just a roof over your head”. But the real star of the show here are the film’s effects. It’s not just the work done on the bear, there are so many scenes that will take your breath away: the jungle in Peru, Paddington’s visit to the Geographers’ Guild archives, even the painted tree on the wall in the Browns’ hallway, the beauty of the effects work is just astonishing, Paddington himself is realised with such care and love – every strand of his fur is visible, the animators have him flying through the air, skateboarding behind a bus and even having a Mission: Impossible moment (complete with theme tune). I truly forgot I was watching a computer generated creature. Ben Whishaw as the voice of Paddington is pitch perfect and I do think he suits the role much better than original choice Colin Firth. The little bear makes you laugh like a drain but also pulls at your heartstrings. Final Words: To sum it up, Paddington is a film that the whole family can enjoy. There’s plenty of slapstick for the little ones, laughs for the adults and a message for everyone. As Paddington says “I will never be like other people but that’s ok”. Well the 21st century Paddington is just like the bear we all grew up with. Thank you Paul King and David Heyman for staying true to the bear we all love. Now, when is Paddington 2 out? Paddington is in UK cinemas on 28 November 2014.